Dolce & Gabbana has recently released a collection of menswear celebrating the Year of the Pig for the Chinese New Year. Such actions have angered the Chinese community, especially those that have not moved on from Gabbana’s racist remark and being called a “country of s***” just last year. The Italian luxury brand owned by Domenico Dolce and Stefano Gabbana faced the wrath of the Chinese last November when an Instagram conversation with Gabbana describing China as a “country of s***” surfaced on the Internet. 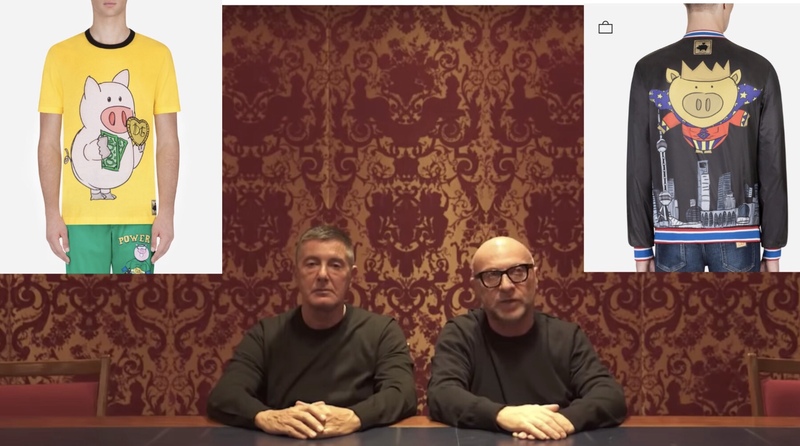 Things got so bad that D&G themselves released a video apologising to the Chinese although the latter was not satisfied by the apology and deemed it insincere. This reaction may have been caused by the fact that it was not the first time that the brand has intentionally or unintentionally poked fun at one of the largest pool of spenders of the world. The first incident was an advertising campaign that stereotyped the Chinese by showcasing a Chinese model struggling to eat pizza and cannoli with chopsticks. The result? D&G had to cancel its show in Shanghai on November 21 and was removed from China’s major e-commerce platforms. Retailers in mainland China and even Hong Kong have stopped selling the brand’s products as well. This gave rise to the “not me” movement that has been adopted worldwide in a fight against stereotyping. Whether or not D&G will get on the good graces of its China market is yet to unfold.